Danielle Laberge has always dreamed of staying and working in Vermont, but after completing her studies in botany and ecology at Vassar College, many told her that she would need to leave her home state in order to advance her career. 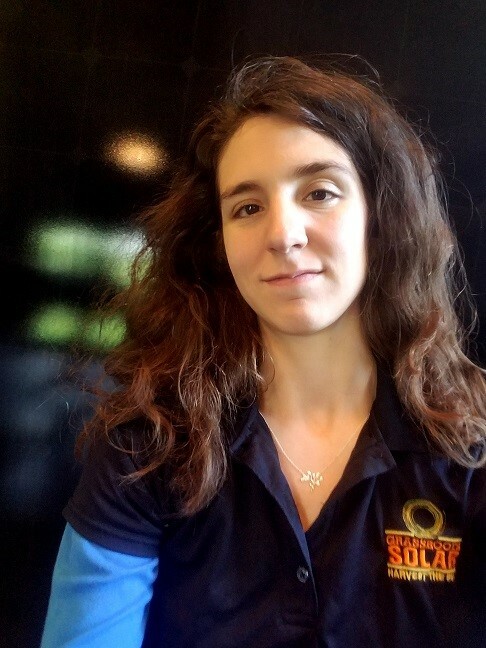 After several years of following this advice and working out of state, Danielle saw an exciting opportunity in her father’s new solar business – Grassroots Solar, a solar company located in her hometown of Dorset specializing in integrating battery storage solutions into their solar installations to help customers achieve true energy independence. She immediately began taking NABCEP-approved training courses to learn how to join the business. Now, as a Sales and Design Representative for Grassroots Solar, she personalizes energy solutions for Vermonters to help everyone who pays an electric bill make the switch to renewable energy. She is particularly excited to excited to bring her ecology expertise to bear in planting pollinator gardens under our ground mounted solar arrays as part of a statewide pollinator protection program. As a lifelong student of science," Danielle says, "I am well aware of our changing climate and the urgent need for resilience and adaptive action to reduce carbon pollution. I'm incredibly excited to be able to return to Vermont to live and work in the community I call home and contribute to the growing climate economy.